The Change Your Clock program is in it’s 26th year! Energizer, the International Association of Fire Chiefs, and fire departments nationwide all join forces to educate you to make safe decisions this time of year. Did you know that 38% of fatal fire injuries occur in homes with no smoke alarms, while 24% occur in homes in which at least one smoke alarm is present but fails to operate, frequently due to dead or missing batteries. Those percentages are high and they shouldn’t be ~ remember to change the batteries in your smoke alarms and carbon monoxide detectors when you set your clocks back – it could help save your life! To help give more families those critical seconds to get out of the house from a smoke alarm warning, Energizer is donating 250,000 batteries this fall to fire departments across the country to distribute to families in their communities. Together, they will host Home Safety Days and neighborhood canvasses spanning throughout National Fire Prevention Month in October until the end of daylight saving time on Sunday, Nov. 3rd. 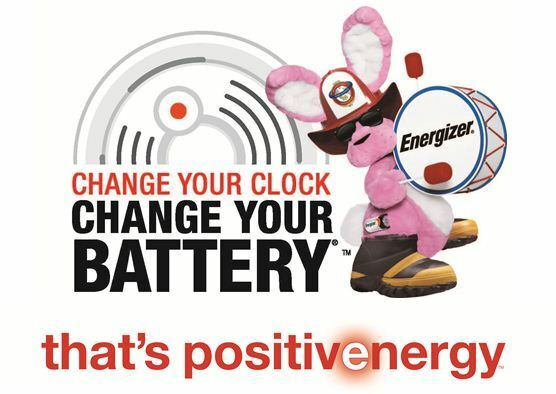 From now through November 3, visit the Energizer Bunny® Facebook page and click on the Fire Safety Info Tab. Here you will have the chance to enter a sweepstakes to win an additional Family Safety Kit. 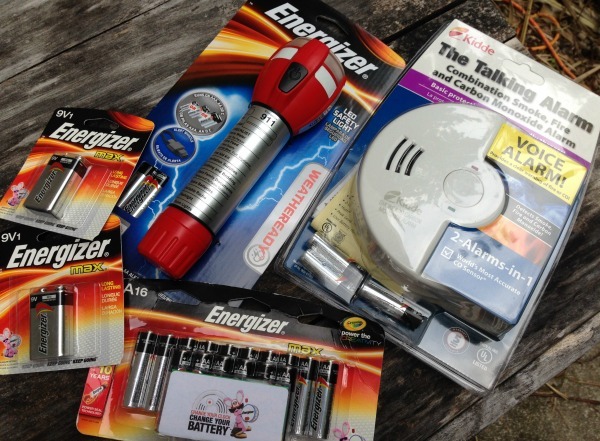 Energizer will be giving away one Family Safety Kit per day valued at more than $167! WIN a Family Safety Kit from Energizer! I received these items for free for review and all opinions are my own. This giveaway will end on October 30, 2013 at midnight EST. Winners will be drawn via rafflecopter. Once a winner is drawn I will contact them and they will have 48 hours to reply before I draw a new winner. Giveaway is open to anyone in US and you must be 18 years of age or older. Giveaway not affiliated with Facebook & I release them of liability. Winner will be posted in the rafflecopter widget. i play swim diaper giveaway! I'm not looking forward to the dark evenings. We live on the edge of a time zone so it's not much fun being on the dark/"wrong" side. I don't look forward to it getting dark earlier, but I do like having that extra hour of sleep. Actually, I am ready for longer days. My brain is solar powered and no matter how much I try, it likes to go to sleep when the sun goes down! I have to agree with you, it seems like we just changed our clocks!! I am NOT looking forward to the amount of daylight we have being shorter, and it getting darker sooner. It- like the entire year- came very fast! I hate to see extra sunlight go, but it brings about fall and winter- my favorite two seasons of the year, so it's a Catch 22. It is still beautiful weather here in the deep south! It is getting darker earlier! We are ready! I miss having fresh tomatoes from the garden, but am thankful it's no longer 100+ degrees every stinkin' day! It Came To Quick For Me. It's probably time for us to change the batteries. Thank you! Time goes by so fast now! The older I get, the faster time goes by! Yes, it will be time to change the batteries before you know it! I was married on a day that the clock went back. Time passes so quickly. I must be old. I know right?! I can't believe it's time again already! Fall back already, summer is gone, wah!! I can tell it's time to change clocks soon because it gets dark so early. I can't believe how quickly time has gone by. Yes, the days are dramatically shorter and it's time to change. Unfortunately lol. This year has flew by! I know; I can't believe it's time to change the clocks already! I hate how early it gets dark out!! Summer went by so fast - I've had to clean up my garden due to frost in the early mornings already. I can't believe Halloween is almost here! Yup, time sure does fly by! Yes, it is Really time to change the clocks soon. I can't believe it, it seems like yesterday it was summer time! Yes it is!!!!!! Time flies so fast!!! I do not like to fall back, it gets way to dark way too early! I don't like changing the clocks back, it's dark when i come to work and dark when I go home. During the summer it's dark until 8 pm. I'd rather we didn't, but it's my reminder to replace the batteries in smoke alarms. I wish we still changed the clocks back before Halloween. Now that its after, the kids only get about an hour to go out. The extra hour of sleep is something we look forward to. Oh good! I hadn't thought about getting an extra hour of sleep soon, Yay! We don't change our clocks in AZ:( I miss it. yea I can't believe it, this year has flown by. Seriously! Didn't we just change them?! Time flies! This is a really nice and useful prize package. Thanks. I changed mine on the first day of fall. Unfortunately it is almost time, I wish it was still summer! yes, it is but we will be missing summer a lot!! Cannot believe it's time to change the clocks but I like fall bc I feel like we get more time! LOL I know, we don't really, but it feels like it! I hate changing of the clocks, messes with my sleep schedule haha. YES! It's almost time to change the clocks again! Remember how SLOW time was when you were a kid? It dragged on and on! Now, as an adult, it just flies by!!! I agree!!! Time to change the clocks arrive before I've turned around once! UGH....I dread the time change....It's depressing to me. The year is flying by!! BUT I am ready for the holidays!! I love when the clocks go back. It's something I actually look forward to even though I think it's completely a waste of money and effort in the 21st century. Thanks for the giveaway. I really need to win this. i never noticed my house has no smoke detectors! i am so shocked that I never noticed until now. I hate time change. When I'm working nights we end up having to pull 13 hours and that makes for a very long night. I don't like change of any kind. I particularly wish they would leave time alone. I know it bothers adults, but just think what it does to the little children in school. NO! I love the cooler weather but I hate when it gets dark so early! I am all for everyone having smoke detectors ,my families are all safety conc, no one has ever had a fire . I thought it was still August. Where has the year gone? Thanks for the contest. Time change always throws my body out of whack. I'd rather we didn't do it. Thanks for the giveaway- a great time to stock up on the essential safety stuff! What... really, the whole clock thing again. I have to agree the time change completely throws me off, and the little one too! year went by too quick! The year just flew by me!!!! At least with Fall back we get an extra hour of sleep. I hate the clock changing. But, I do prefer gaining an hour instead of losing it. I wish they would leave it year round & not have to change the clocks! changing the clocks always seems to mess my schedule up. this is my favorite time change......that extra hour in the am is nice, thanks for the giveaway! I can't believe it's time o change the clocks already. It never used to mess me up but in recent years it has. Ugh - I hate the time changes. I wish they'd leave it alone! I wish the clocks were set back before Halloween like they used to be. The Trick or Treaters can't enjoy my lights, as it's still daylight when they get here! Thanks for the giveaway. I am glad we gain an hour next weekend. I am not ready for it to get dark early afternoon! Crazy right! This year has flown by! Seems like I just changed the clocks last month! Cant wait to sleep in an extra hour on Monday. Change the clock already? that means I get to stay up late and watch Sat Night Live instead of DVRing it. I am so not ready for this. I'm a summer girl. Don't mind the fall back but not crazy about the spring forward, love my sleep. I love winter but I don't like how dark it gets early. I really hate changing the clocks. I wish we kept one time year round. This next weekend coming up it's time. i dread the time change - i feel like i should be in bed about 7 pm! We change our batteries in our smoke alarms when we changed our clocks. This year seemingly has flown by! The days are so short anywhere here in Downeast Maine, that when we turn the clocks back it seems like there's hardly any daytime at all. Takes some getting used to, for sure. We'll be changing our smoke alarm batteries the same day, as usual. Summer zipped by, cold weather coming, time for the time change and battery change. Yes! I am so ready for the time change! Here is southeast TX before the time change it's dark when you wake up & the Moon is out before sunset! Glad to get back to normal again. I wish we didn't have to move the clocks at all. Thank you for the giveaway! I'm not looking forward to the change. It will be dark so early. Yes, it's that time again to change the batteries in our smoke alarms. I hate the time change- but it does remind me that I need to change the batteries in my smoke detecter. I can't believe how fast time flies.. it's already time for the holidays! Let's fall back! Hard to believe time to turn the clock back! This year has flown by, before you know it HO HO will be coming down the chimney!